The momentum gained by the end of 1966 carried over into 1967. Additional troops and other available resources enabled the scope and pace of our offensive operations to increase steadily throughout the year. . . . With these larger forces, added firepower, and improved mobility, we carried the battle to the enemy on a sustained basis throughout the year. . . . Yet, despite his staggering combat losses, he clings to the belief that he will defeat us. I wish I could report to you that the conflict is almost over. This I cannot do. We face more cost, more loss, and more agony. For the end is not yet. I cannot promise you that it will come this year—or the next . . . . General Westmoreland reports that the enemy can no longer succeed on the battlefield. Our pressure now must be—and will be—sustained until he realizes that the war he started is costing him more than he can hope to gain. In operational terms, taking the offensive meant continuing search and destroy operations begun in 1966 and initiating newer, larger ground operations in 1967. As before, ARDF would continue to provide a principal source of intelligence in planning these operations and conducting them once underway. On 1 January, Det. 1 of the 6994th at Nha Trang reported that it was fully operational, base facilities having at last been “acquired or constructed.” At Pleiku, Det. 1 of the 361st Recon Squadron (RS) and the back end crews of Det. 2 of the 6994th, having flown their first mission less than a month before, averaged four missions per day in January. At Tan Son Nhut, the 360th crews were fortified with “combat liquor rations,” dispensed at the post-mission briefing after each combat sortie.1 To improve efficiency in plotting fixes, the 360th Tactics Panel toyed with the notion of training other [unspecified] crew members to assist the navigator. Another idea would’ve had the pilot position the aircraft during target acquisition while the X operator printed the LOP data. The navigator would concentrate on plotting previous targets. Neither of these schemes was implemented, but a locally designed one-piece plotter replaced the three instruments previously required for the navigator to manually plot a fix. The design proved to be very successful and arrangements were made to procure 150 of the new plotters in Japan. Early in the year serious problems were encountered with the ARD-18 equipment. Air aborts steadily increased, and flying days lost to aircraft non-availability jumped from 44 in late 1966 to 97 in January, 1967. Aircraft 43-48933 was grounded for 17 days, 43-15112, the first PHYLLIS ANN aircraft to arrive in country, was down for 15 days. Others were out from two to six days; mission effectiveness was degraded accordingly. Sanders determined that some components failed, apparently in random fashion, after approximately 600 hours of operation. Parts were juggled between new production and the unexpected need for replacement units. In the field, cannibalization was obviously an emergency measure that could not be long tolerated. A Sanders engineer was dispatched to Tan Son Nhut to address the problem. Repairs and modifications were undertaken, pending more complete identification of the problem and application of solutions. 1967 also brought changes in unit, mission, and equipment designations. As part of a general reorganization of the USAF’s reconnaissance structure in Southeast Asia, several former reconnaissance squadrons, including the RB-66 electronic countermeasures aircraft out of Thailand and the three ARDF squadrons in Vietnam, were redesignated as Tactical Electronic Warfare Squadrons (TEWS). Concurrently, RB-66 became EB-66 and the Electric Goons were now EC-47s, the “E” prefix for Special Electronic Mission replacing the reconnaissance “R”. In April, the cover name for the EC-47 program was changed to COMPASS DART, evidently the result of a security compromise. PHYLLIS ANN, having faithfully served the war effort for more than a year, was formally retired. By the spring of 1967, aircraft strength at last began to approach the overly optimistic target numbers laid out in the original PHYLLISS ANN planning. Two EC-47s arrived in January, three in February, capped by a surge to ten in March. Aside from the mortar attack on Tan Son Nhut in December, 1966, the fleet had suffered no losses or serious damage due to enemy action. But the calls were getting closer. Since the inception of the program, nine PHYLLIS ANN aircraft had been hit by ground fire while flying below 2,000 feet. In March the 460th TRW issued a directive on “Minimum altitudes and combat tactics.” In the future, a minimum altitude of 2,000 feet above ground level (AGL) would be maintained—higher if so indicated in the pre-flight intelligence briefing. Crews were cautioned to “fly random patterns, not use the same doppler setting point consistently” and in general avoid maneuvers that might enhance the effects of enemy ground fire. The first total aircraft loss had already come, not from enemy action, but from a wayward China Airlines C-46 under contract to Air America. After exiting runway 25 at Tan Son Nhut, the right brake on the C-46 failed and the bird ground looped into a parked EC-47. No personnel were injured, but aircraft 43-49679 was damaged so extensively that it was immediately written off. On 9 March, the inevitable finally happened. EC-47 serial number 43-49201 of the 361st RS, operating under the tactical callsign TIDE 86 took off from Nha Trang around 1:55 PM local time on a routine ARDF mission fragged in an area some 125 miles north of the base. When the aircraft failed to return as scheduled, a communications search was initiated. Results were negative, and at 11:30 PM local, the crew was declared MIA. Thanks to the Airborne Mission Supervisor (AMS) and his analytical tools, DRILL PRESS could frequently identify priority targets, a capability the bare bones COMPASS DART aircraft did not possess. Beginning in January DRILL PRESS began tipping off both Army and USAF ARDF aircraft as part of an experimental program. Although 348 priority targets were tipped off, only 34 fixes were obtained. While DRILL PRESS could intercept the targets some distance away, the signals were generally beyond the lock-on range of the ARDF equipment in the other aircraft. However, two other innovations were to have a lasting impact on the EC-47 program. Most important was the request to install NSA’s KY-8 secure voice system in the DRILL PRESS aircraft, thus eliminating the time consuming chore of encrypting target data on “one time” pads before transmitting the information to the DSU or to other aircraft. A separate program would install wiring for both the KY-8 and two additional collection-only “Z” positions, intended to supplement DRILL PRESS, on 23 COMPASS DART aircraft. These modifications, to be performed on two aircraft at a time at Itazuke airbase, Japan, would keep the affected EC-47s out of service for approximately ten days. By programming the work so that each of the TEWS had only a single aircraft out at any one time, mission disruption would be minimized. Determining optimum locations for the ARDF units continued to be a topic of discussion. For various reasons, military as well as political and economic, thought in the higher echelons was being given to making Nha Trang a strictly Vietnamese base. Consideration was briefly given to Cam Ranh Bay as an alternate, but this was quickly dismissed. Phu Bai and Da Nang, while geographically more desirable, were found to be incapable of supporting more aircraft. For the moment, the 361st/Det. 1 team stayed on the beach at Nha Trang. In late 1966, message traffic out of Udorn, Thailand, began to inquire about ARDF support for “controlled American sources” (i.e., CIA) operating in Laos. USAFSS and even the Air Force Chief of Staff warmed to the idea, going so far as to initiate planning for deployment of one ARDF and one DRILL PRESS aircraft to Thailand in early 1967. The high regard in which COMUSMACV held ARDF was revealed when Westmoreland flatly rejected the idea, declaring that “any diversion of these resources is unacceptable.” There the matter rested, but it was by no means a dead issue. Meanwhile, ground operations throughout South Vietnam continued at an ever increasing level of intensity as "the year of the offensive" went into high gear. The demand for SIGINT support from both COMPASS DART and DRILL PRESS would increase accordingly. 1. Click here for a discussion of combat liquor rations. 2. Unfortunately, the CBS news film was either destroyed or had deteriorated to the point that it was eventually trashed. 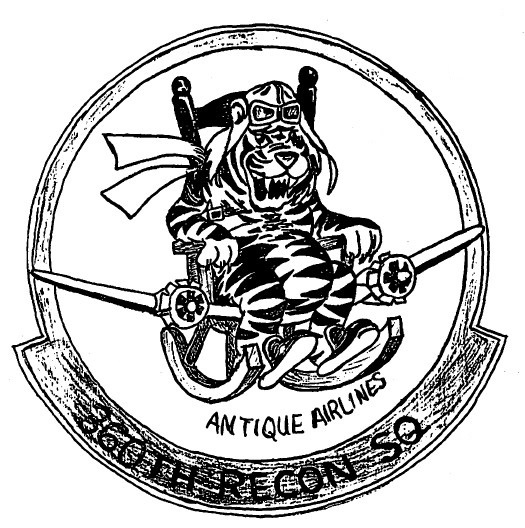 Click here for some interesting background on the Old Tiger/Antique Airlines emblem. 3. Click here for a complete run-down on EC-47 camouflage and markings. The quotations at the beginning of the first section are from the 1967 MACV Command History, Volume I. The rest of that section is from Report on the War in Vietnam (as of 30 June 1968), jointly authored by Gen. Westmoreland and CINCPAC, Adm U.S. Sharp. The remainder of the narrative is based on the histories of the 6994th (Jan-June '67) and the TEWS (Jan-Mar '67).